It’s impressive how “suprematically” simplified bodies of Malevich’s sportsmen and multi-colors of their clothes and heads (with intentionally undifferentiated front and back, faces with occipitals) combined versatility and uniformity, plurality and monotony. We know a similar “miracle” in our own country (US), in which pluralistic choices are connected with standardized (consumerist) choosing, or versatile needs and tastes – with equally uncreative (greedily passive) appropriation. Money becomes the common denominator of everything and private guns of multiple types and designs – the common denominator of survival of whole nation. 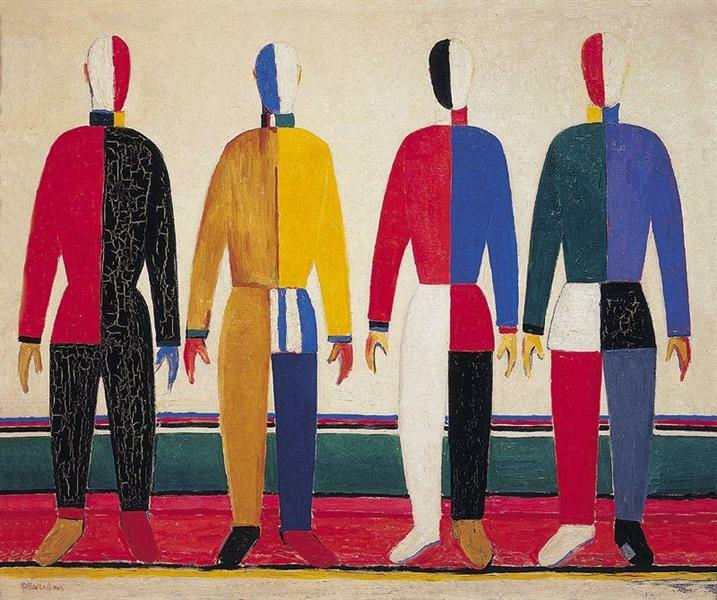 The fact that the principle of multiplicity of the colors of sportsmen’s clothes is applied to the heads and faces is provoking a joke that Malevich’s athletes are without clothes at all – that their bodies have a magical biological ability to imitate sport clothing – so dedicated these people to mass sport. We see how radical Malevich’s criticism of extreme psychological standardization of the Soviet sportsmen. According to his stylistic elaborations they are without originality of characters and any personal uniqueness. They’re organs of the Soviet state. They’re just links inside a totalitarian society. They’re, as if, made of wooden boards, not even of the Biblical clay (Adam) or organic rib bone (Eve). As we see in Malevich’s “Sportsmen” he disapproved of standardization of people in USSR. Any totalitarianism – socialist, Nazi or commercially fetishistic when “everybody” is supposed to calculate money- or profit-making and worshipfully dream about becoming at least millionaire – needs standardization. Let’s again look at Malevich’s sportsmen – Soviet Union was promoting mass sports, like US does, but without fueling it with the money dreams of the athletes and investors – it was interested in building physical endurance and aggressive spirit of the population to use it for fight for the fetish of Communist ideology. According to Malevich, to live without an autonomous human soul, which always expects from life to take it seriously regardless of “survival”, money, profit, career, wealth calculations, proud conformism, etc. Autonomous human soul has a sublime stubbornness as a spiritual quality vis-à-vis standard demands of everyday life and standard expectations from totalitarian elites waiting from the people self-sacrificial obedience and common worship of collective idol, be it Communism, Nazism, fascism or the golden Calf. It’s at this point that Malevich‘s sportsmen are joined by Nolde’s soldiers, and sport transformed into preparation for wars and wargames. In Nolde’s painting we see two kinds of soldiers’ faces – pink and naïve faces of recently recruited soldiers – faces communicating loyalty to the superior ranks, and, on the other hand faces of a more experienced soldiers – darkened, scorched by the battles and blood, blindly communicating monosyllabic danger to the enemies. The gazes of both types of soldiers are, as if, without eyes. 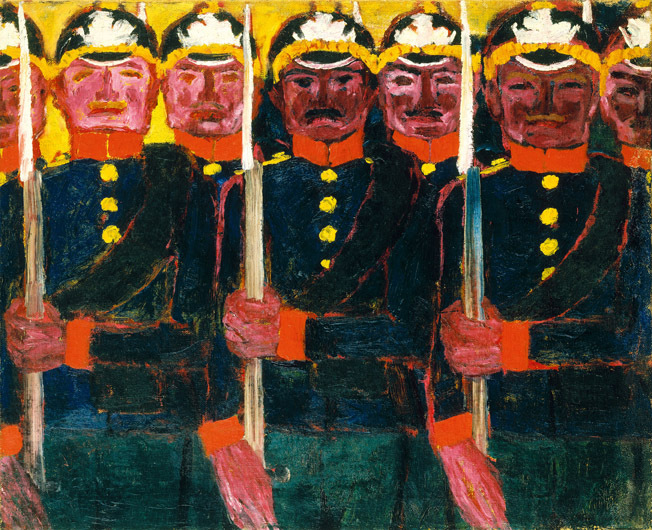 Nolde’s soldiers are, as if, also made of wooden boards, like Malevich’s sportsmen. But aren’t we here a little too rigid in our interpretation of sports and wars? Why to dramatize so darkly the fact that children and the youth will physically train their bodies and be dedicated to sports? Should they instead to sit whole life with their mammas? Surely, neither Malevich, nor Nolde could mean anything like this. Neither one of them could be against physical fitness for the next generations. Nobody can be just negative about sports by itself or reasonably short military training, but it’s a question of extreme disproportion between involvement with athleticism and acquaintance with weapons and the necessity to build in the young generations the internal world, positive curiosity towards the otherness of the world and other people and humanistically intellectual structures (acquaintance with liberal arts) which are able to equip the young to really understand human life in its wholeness. It’s here, it seems, that the stylistic eccentricity and meaningfulness of Malevich and Nolde’s two paintings became understandable and more – necessary. It’s a great when visual arts can not only wink, not only fascinate, not only make us astounded and not only awaken our feelings or whisper something to our intuition, but rationally speak to us profound sense which proves itself exactly when we feel displaced by it from our everyday complacency.